Research confirms that people usually remember the first and the very last things you say when delivering a speech. It is, therefore, of immense importance to understand how to end a speech. You cannot be too creative with the conclusion of your speech, or it will taint the rest of your speech as well. Similarly, you cannot be too conventional either. You see, it is important to understand how to conclude a speech to leave a greater impact on your audience. Keep reading to find out more about it. There can be many ways to end a speech. You can summarize important points you've covered in the body of your speech, or you can finish abruptly with a question left for your audience. Here are some good suggestions for anyone interested in learning how to conclude a speech. Borrowing words from a respected leader is a great way to blend the past with the present and inspire people to relate to your speech and join your cause. Be sure to summarize all the main points of your speech quickly and add a finishing touch by sharing the words of a revered leader. It's always one of the most impressive ways to end a speech. You can choose to conclude your speech with a challenge if you're delivering a speech in front of your employees and your goal is to motivate your sales force. Cover the main points of your speech and then challenge your audience to achieve a target and introduce an incentive, they will get if they succeed. When it comes to how to end a speech, there is nothing worse than ending a speech that tells nothing about what the audience should do next. The purpose of your speech is in your call to action, and that's why you should never end on without it. You want your audience to respond in word, thought, action, or in another way, so guide them in the right direction at the end of your speech. This can be a rather tricky way to end your speech, but it can be quite impactful. You need to use a brief story to drive a message – it could be anything about a fussy client you impressed or anything related to your field. Keep it short but interesting. One of the simplest ways to close your speech is to refer back to a quote you may have shared in the opening of your speech. State that once again and tell people that we have arrived where we began. This will often make it easier for your audience to remember your main point. Last but not least to how to end a speech, it's clever to use a "sing song" close. You need to pick a phrase and repeat it throughout your speech. Then, close to the end of your speech, you need to repeat that phrase and ask your audience to repeat it with you. A phrase could be as simple as, "Together, we can win." Say it yourself and make your audience repeat it with you for a better impact. It is definitely important to learn how to end a speech to make your speech more impressive. It is, however, equally important to understand how not to conclude your speech. Here are two worst ways to end your speech and leave your audience in disgust. It is always important to announce you're wrapping up your speech. Without a clear road sign that your speech is about to end, you will leave your audience confused and lost. You need to give your audience a clue that you're getting ready to end your speech. This will alert your audience and they will prepare for the ending, which in turn will make your ending a lot more impactful and memorable for your audience. 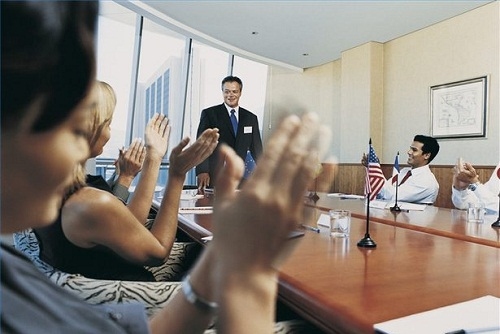 Even if you have delivered a highly informative speech, don't expect your audience to be with you all the time. The average adult attention span is somewhere close to five minutes, and it may become even difficult for your audience to keep up due to task-saturated schedules, fast-paced technology, stress, and attention deficit disorder. You will spoil everything if you don't remind them of your key points once again in the closing. Simply summarizing your most important points will do the trick.